With warmest winter wishes and happiest holiday greetings, Volcano Art Center welcomes all to the 17th Annual Christmas in the Country celebration starting Friday, November 18, 2016. Featuring the Annual Invitational Wreath Exhibit that continues through January 2nd, 2017. This year’s Christmas in the Country promises an abundance of art and aloha to kick start your holiday season. Every year, beginning on the Friday before Thanksgiving, VAC Gallery in Hawai‘i Volcanoes National Park creates a merry scene of an old-fashioned Christmas inside its 1877 historic building. In addition to the exquisite artwork Volcano Art Center has become known for showcasing year-round, you’ll find unique holiday offerings of island-inspired gifts, ornaments and decorations made by Hawai`i Island artists, including some that are VAC exclusives. The concurrent Annual Invitational Wreath Exhibit presents one-of-a-kind wreaths in a variety of imaginative media, techniques and styles, from the whimsical to the traditional. “Those looking for truly original wreaths as well as one-of- a-kind , handmade gift items will not be disappointed by the selection created by our local artistic community, ” states gallery manager Emily C. Weiss. As in years past, Christmas in the Country begins with an exclusive members-only preview party on Friday, November 18th at 5:30pm and features a fresh lineup of artists hosting special events throughout each weekend. Member Appreciation Reception and Christmas in the Country Preview. VAC Members are invited to be the first to view the full collection of unique wreaths and high-quality handcrafted decorations and gifts offered only during Christmas in the Country. Enjoy complimentary gourmet pupus, mulled cider and champagne, prize drawings and your membership discount. Not a member? Joining is easy and secure, ONLINE or at the door upon arrival. Held at the VAC Gallery in Hawai‘i Volcanoes National Park. Free, park entrance fees may apply. Volcano Art Center’s Annual Christmas in the Country Celebration. Two full weekends of special holiday celebrations. Including art demonstrations, print and book signings by VAC Gallery artists, plus a fine selection of quality handcrafted decorations and gifts offered only during the holiday season. Held at the VAC Gallery in Hawai‘i Volcanoes National Park. Free; park entrance fees may apply. 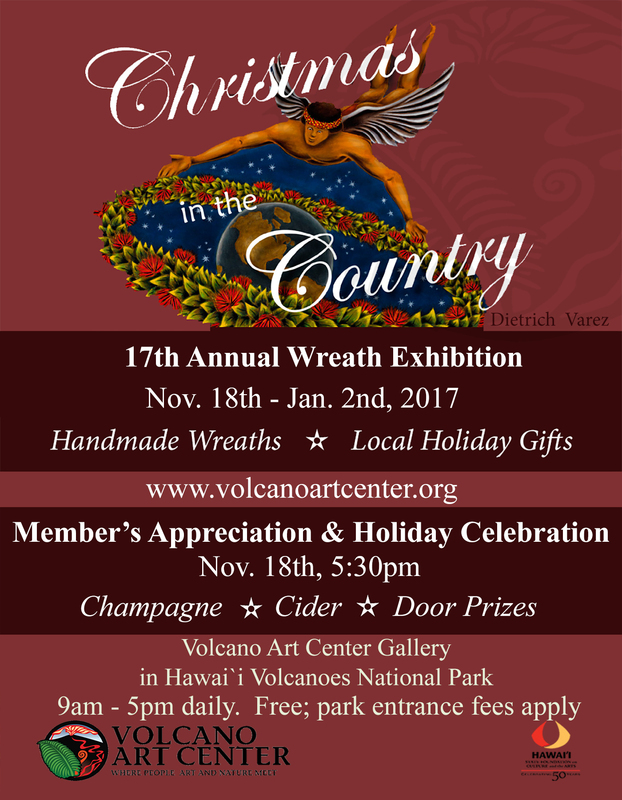 Volcano Art Center’s 17th Annual Invitational Wreath Exhibit. Gallery artists working in a wide variety of media, materials and techniques present their highly creative concepts of ‘wreath’. Held at the VAC Gallery in HVNP. Free; park entrance fees may apply. Hula Kahiko featuring Kumu Hula Leilehua Yuen & Manu Josiah. The Volcano Art Center’s 2016 Hula Kahiko series continues with a presentation by Na Kumu Leilehua Yuen and Manu Josiah. Well known for their informances, in which storytelling, science, chant, and hula are blended to create a journey through Hawaiian history and culture. Please join them and some of their students for an event of traditional chant and hula at Kilauea. Free; park entrance fees may apply. Print and book signing with Caren Loebel-Fried! Come celebrate the release of Caren’s newest woodblock design “Kīlauea Point.” This piece of art was created by Caren Loebel-Fried for the Kīlauea Point Natural History Association to support environmental education programs, wildlife conservation projects, and ongoing maintenance of the Daniel K. Inouye Kīlauea Point Lighthouse. Free; park entrance fees may apply. Lampworking demonstration by Nash Adams-Pruitt. Come witness glass ornaments being created before your very eyes. Using a torch to melt rods of glass, once in a molten state the glass is then formed by shaping with tools and hand movements. Held at the VAC Gallery in HVNP. Free; park entrance fees may apply. Christmas in the Country Expands to Niaulani Campus. 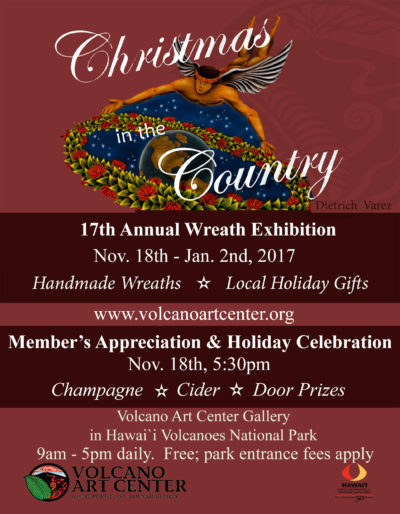 Come celebrate the spirit of the holidays and view select members of the Volcano Hui displaying handmade art and gifts as part of the annual Volcano Hui Tour. Beautiful live poinsettia will be on display and available for purchase to enhance your home for the holidays as a fundraiser for Friends Of Hawai’i Volcanoes National Park. Located in VAC’s Niaulani Campus at 19-4074 Old Volcano Road in Volcano Village. Aloha Friday: Lei making with Kaipo AhChong. Tropical Agriculture farmer Kaipo AhChong will share his expert lei-making skills with VAC visitors. As a member of Halau Na Kamalei, his unique experience marries the science of agriculture with Hawaiian lei and hula traditions. These free cultural events are supported in part by a grant from the County of Hawai`i, Dept. of Research and Development and the Hawai`i Tourism Authority. Free; park entrance fees apply. Meet Lanaya Deily, Volcano Art Center’s 2015 member’s Choice Wreath award winner! Lanaya will be sharing her photographs and special holiday gifts available only during the holiday season. Lanaya will also share her photographs of Hawaii’s butterflies. Blackburn’s Blue and the Kamehameha are the only two native butterflies in the state. The Kamehameha Butterfly is also the State Insect! Free; park entrance fees apply. Book and print signing with Kathy Long! Kathy will be on hand signing her extensive collection of prints which represent her many years of dedication to Hawaii’s unique culture captured in paint and pastel. Held at the VAC Gallery in HVNP. Free; park entrance fees may apply. Book and print signing with Alan McNarie! Volcano resident and writer Alan D. McNarie will be on hand to sign his recently released novel “The Soul Keys”. The novel is noted to “not just bending the rules: it explodes reality and puts it back together again. Needless to say this thought provoking book is perfect for that hard to buy for person on your gift list. Held at the VAC Gallery in Hawai’i Volcanoes National Park. Free; park entrance fees may apply. These programs are supported, in part, by the Hawai‘i State Foundation on Culture and the Arts, through appropriations from the Legislature of the State of Hawai‘i.